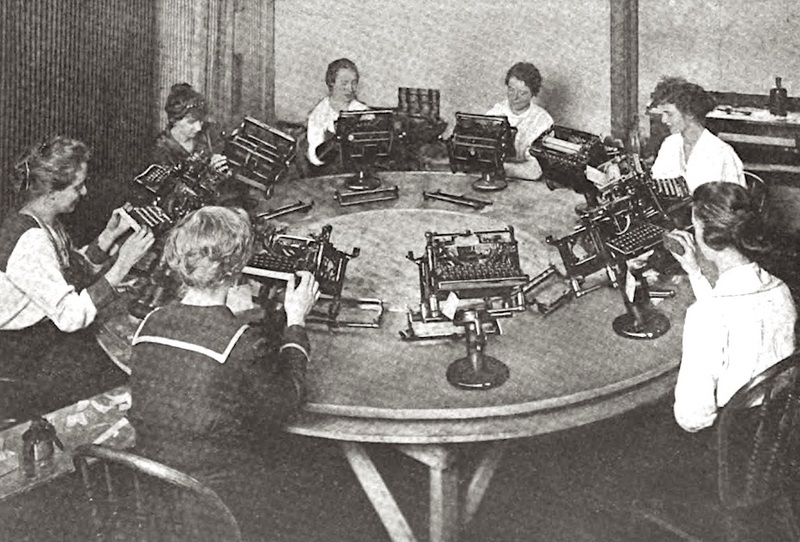 Women in the employ of the Typewriter Emporium, reconditioning machines for the secondary market. From “Rebuilt typewriters,” indexed below, 1918. This page functions as an index of primary source documents on the pioneering efforts of women who employed the typewriter to gain access to the workforce in the late 1800s and early 1900s. These documents tell a fascinating story is more readily available in this age of digital archives. The links below either point to a post at Type-Writer.org that includes my own comments or simply the documents themselves. Off-site links are noted. This page is a work in progress. If you have a link, a document, or a suggestion, please email at netadams (at) gmail.com. A battle of the presses (1886/87) – An exchange between the Chicago Tribune, which portrayed female typists as dainty objects, and the Cosmopolitan Shorthander, which objected to that portrayel. Work for nimble fingers: It’s women’s work (1886) – An early assessment of women as stenographers, a field which women were entering in vast numbers with the introduction of the typewriter. The phrase “women’s work” is indicative of the author’s attitude. Eldora J. Schofield: Teacher, typist, editor (1887, etc.) – Multiple accounts of an early female editor who also worked as a teacher and typist. Jennie Wehle: A lady typewriter (1888) – an account of Jennie Wehle, daughter of a millionaire lawyer, who sought and sustained employment as a typist. She comments on the dignity of the work and the right of women to seek employment. Typewriters, girls, and drama… (1888, etc.) – a series of humorous anecdotes on women and the typewriter from a variety of publications. This post includes one cartoon. Peggy Remington’s first dictation (1890) – a clever narrative from Peggy Remington (fictitious person?) about her first day as a typist, working in a male-dominated office. Spelling is a dilemma. He married his typewriter (1891) – a humorous anecdote punning the term “typewriter,” a word that applied both to the machine and the operator (typically women) in the late 1800s and early 1900s. Woman’s labor vs. man’s (1891) – an editorial from The Shorthand Review on the necessity of equal pay for men and women, though the author’s principal concern is the impact on stenography and typewriting by the introduction of cheaper female labor. The author criticizes women for accepting lower wages. Some elements of the critique, however, are progressive. Stenographers — Not ‘Type-Writers'” (1892) – A female stenographer protests the use of “typewriter” as a term for both the machine and the operator, noting that the term is used (in her view) exclusively to describe the female operator of the machine. The Shorthand Review published the piece, but with a prefatory note, which is included in this post. Another lucky typewritist (1895) – An oft-held view was that female typists simply wanted to marry well. Many women objected to this claim, though one typist did indeed marry well, as seen in this article. That said, that the typist was seeking marriage may well have belied her intentions: simply to find work; love came later. “The Type-Writer’s Revenge” (1895) – A humorous cartoon illustrating the relationship of a female typist and her employer. Typewriter ballet (1895) – An account a ballet choreographed by Nellie Fox for the theater. Typewritists classified (1895) – A decidedly unflattering portrait of female stenographers, which is representative of how many (men) saw women in the industry. ‘Tis a sin, Fay-Sholes (1903) – A female typist objects to the use of the “typewriter joke” in an advertising card for Fay-Sholes. The publication sides with the letter writer. “Homely girls get no jobs” (1913) – The headline misses the real claim of four women who championed merit-based hiring, but the article does their effort justice. Miss Remington’s war on women wasting time (1918) – a moralizing piece from Remington Notes, a house organ for stenographers and typists. That “Miss Remington” was an actual woman is a question. The piece highlights the benefits of the Remington typewriter in a demanding and perhaps condescending tone. Rebuilt typewriters (1918) – from Typewriter Topics, a trade publication, an account of the secondary typewriter market for reconditioned machines in which women found employment. Gender & the Office – a page at the Early Office Museum with statistics about female employment in the late 1800s and 1900s. The page includes images from the period. Waller, Robert A. “WOMEN AND THE TYPEWRITER DURING THE FIRST FIFTY YEARS, 1873-1923.” Studies in Popular Culture, vol. 9, no. 1, 1986, pp. 39–50. JSTOR, JSTOR, www.jstor.org/stable/23412899. © 2018 – 2019, Mark Adams. All rights reserved.